Walker’s birth story is pretty crazy and completely opposite of what we had planned for (a med free birth), but he is healthy and strong (praise God!) and that is all that matters. Here goes…. I had contractions off and on for a few weeks and was progressing at every appointment, so I really believed Walker would come without induction, but I was wrong. I agreed to have my water broken at 41 weeks because he was measuring so large. After a few hours, I was contracting harder, but wasn’t progressing (I was 4 cm and 80% effaced when I checked in) so they started pitocin. (In hindsight, I should have asked to wait on starting the pitocin). Right after starting the pit my Dr came in to check me. I was having a pretty strong contraction at that point and she laid her hand on my belly and said, “I’m going to wait until this contraction is over to check you.” After a couple of minutes my contraction was not subsiding so they put in an internal fetal monitor and the baby’s heart rate had dropped from 140 to 60. They gave me oxygen and a shot and had me get on my hands and knees to stop the contraction, which didn’t work quick enough so all of the sudden they called for a stat c-section and 20+ people showed up rushing around.My family, Mike, and I were shocked and terrified at this point because everything had looked good and had been completely normal, but within seconds things were going so terribly wrong. They rushed me to the OR, strapped my arms down, cathed me, gave me general anesthesia and within 15 minutes Walker was born. All while my poor husband was waiting outside the door terrified and praying desperately for our protection. It was a CRAZY CRAZY experience. Seriously, I felt like I was in a movie in which I might not make it to the end. I know God’s hand was over me though because I hadn’t seen my Dr since check in time hours before and she was the one who laid her hand on my belly during the exact contraction that caused distress (which lasted 6 minutes by the way). Also, I didn’t panic (not outwardly anyways) and was filled with a weird calmness as everything was crashing down around me. I have no clue why it all happened this way or what caused it (pitocin, anyone?) or if it could have been prevented, but I’m so happy that my little one is safe and healthy. As of now we are just trying to survive the crazy newborn days. I know I have it pretty easy though because Walker is a contented baby and he already sleeps 4 hours at a time at night. We are settled into a good routine for now and just trying to adjust to our new family. Oh Missy, what a crazy experience.... you are so blessed that at least Walker was born healthy and safe. Praise God! So glad to hear he is doing well. My mom had a c-section with me as well but hers was planned because I was transverse and never turned. Rest up and take it easy! 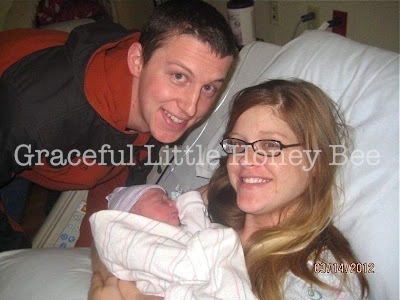 Missy, thanks for sharing about your experience...not very much unlike my own with our first son! Glad its behind you and that the Lord has blessed you with a heathy and happy newborn. I love the photo here with you and your hubby and son, Walker. Everyone looks so excited! Hope you are able to get some rest during these early weeks. I am so glad Walker and Mama are doing fine. The first picture of him smiling is absolutely precious! Congratulations!! WOW- praise God you and Walker are healthy and home safe. The pictures are so sweet, especially the one of him smiling, so precious! Congratulations! I am so glad everything turned out well. He looks healthy and happy. Missy...he's just so very beautiful. I am SO glad the Lord was with you through every moment. So very glad you are okay and Walker is okay. Beautiful days are coming...though the ones right now are beautiful too. May your days be slow and lovely in this quiet beginning time. What a precious little bundle you have to enjoy :). Blessings sweet Mama! So happy it's over for you. Blessings on you and yours. An experience you will never forget... Reading your experience made me think back 17 years ago when I had my first. Thank you for sharing, enjoy your little one. Although you will get sick of hearing this, the years will go by fast.. Congratulations on the new addition to your family, may you have much happiness, good health. Missy, I was in much the same position. I was induced, had crazy contractions and then I had an epidural, but after 17 hours of labor, emergency C-section. My second one was a planned C-section which was so much better. I'm so glad God brought Walker safely into the world. It's so scary as a first time mom when these things happen. Blessings! Thanks for sharing your experience. Since my first birth was so crazy I'm apprehensive about the future. I know God will take care of me though!